If you’ve been following my blog for a while, you probably know that I’m a huge burger fan! Although the words “healthy” and “burger” are seldom used in the same sentence, they don’t necessarily have to be contrary. Veggie burgers can actually be super healthy! My new favorite veggie burger is this vegan mushroom burger with chickpeas, oats, and lots of fresh parsley. It’s super delicious, incredibly healthy, and just perfect for fall and winter! When making vegan burgers, you often got the problem that the burgers are really delicious but don’t hold together very well. Or they’re sticking together, but the texture just doesn’t seem right. Either it’s too soft or too crumbly. I’ve tried tons of vegan burger recipes over the last couple of years and I think veggie patties with chickpeas are by far the best. They’re really firm and have a great texture. I’d say together with lentil burgers chickpea burgers are my absolute favorite! 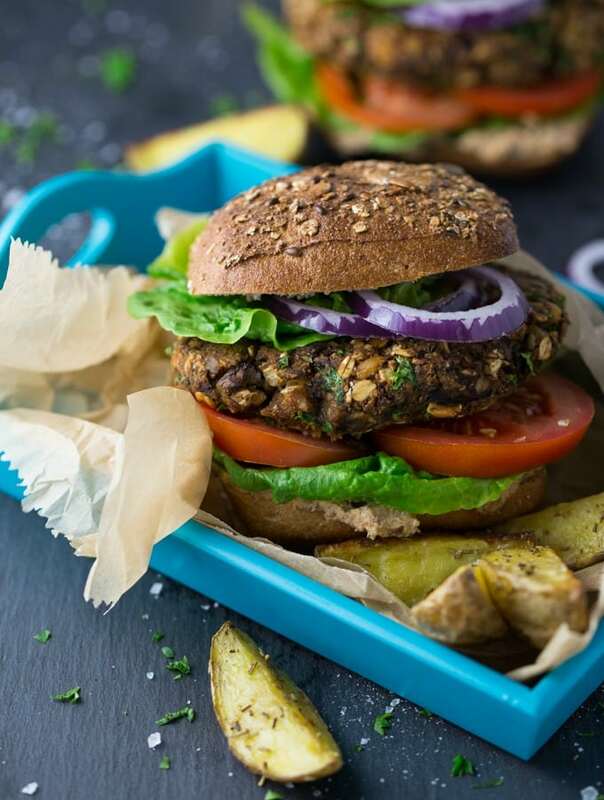 Check out my lentil burger with basil mayonnaise if you like to give it a try. The combination of rolled oats and ground flaxseeds also works really well for vegan burgers. For this vegan mushroom burger, I used cooked chickpeas, flaxseeds, rolled oats, whole wheat breadcrumbs, and a grated carrot. And of course mushrooms!! To make these veggie burgers even firmer, I ground half of the rolled oats into a powder. Or you could also call it oat flour. Either way it really helps with the texture of these veggie burgers. Just use your blender or food processor and pulse the oats for a couple of seconds. We usually have pan-fried burgers, but lately I’ve started to make them in the oven. This also works really well for these vegan mushrooms burgers. They got really crispy and you can save lots of oil and unnecessary calories this way. Plus, it’s actually much easier to just put them in the oven and wait till they’re ready to eat, right? I baked them for 30 minutes and flipped them over after the first 15 minutes. So it’s all pretty easy. I served these vegan mushroom burgers on whole wheat buns with lettuce, tomatoes, red onions, and a sunflower tomato spread. The spread was store-bought, so I don’t have an exact recipe for it. But if you can’t find anything similar, the burgers will also be great with ketchup and mustard or any other burger sauce. This vegan mushroom burger is made with chickpeas, oats, and chopped mushrooms. It's super delicious, incredibly healthy, and easy to make! 4 tablespoons sunflower tomato spread You can also use ketchup, mustard, or any other burger sauce instead. In a small pan, heat some oil and sauté the onions and the garlic for about 3 minutes. Together with the remaining ingredients, add them to the chickpeas and mix well. Form four large burger patties (or 6 smaller ones). Line a baking tray with parchment paper and put the burger patties on top. Bake for 30 minutes at 350 °F. Flip them after the first 15 minutes. *Makes four large burger patties or six smaller ones. These look so delicious and hearty! This look so hearty – there’s no need for meat when you can have a burger like this! I LOVE burgers! I could definitely eat them every darn day! And mushrooms are on my top faves too. YUM! This sounds SO good! I can’t believe I’ve never tried a mushroom burger before, I bet it’s delicious. Now that is a veggie burger! I love all of the wholesome goodness you packed in this. That is one gorgeous veggie burger! And no TVP in sight! Love it. I will try the burger, it looks so yummy and simple to make! But I really wanted to thank you for the multiplier function in your recipe! I am looking for recipes to make for large groups and the ability to get the recipe multiplied for 20 burgers instantly is very useful! Is that something you get with the web site, the template or what? Thanks again. I just tried to grill them. The center of the burger remained uncooked but the edges were cooked. I believe on low and longer than 7 min. on each side. I need to perfect the time. I really liked the flavor. but I needed to add more seasoned salt. These were the best veggie burgers I’ve tried so far!! Gonna make them on the grill next time. I used portobello mushrooms. So yummy! I made this hamburger today. WOW! WOW ! WOW! Unbelievably delicious, actually better than that. I did add a bit of Monterrey Smoke Steak Seasoning because I like it so. They stay together, yes they really do. I made them the size I usually make my hamburgers and I ended up with eight as opposed to the four as defined in the recipe and I am glad I did because one is really very filling for me, so if you are not a big eater, you may want to think the size you make. Sooooooooooooo good. This is a keeper recipe. I plan on freezing, so I will be back to let you know how that works, but I suspect they will be just fine if not better. A big thank you Sina.